Today in the travels of William Smith, we’re heading to one of the most exciting periods in the history of Wales and that is….. the age of the dinosaurs! Dinosaurs first arrived during the Late Triassic period from around 225 million years ago. At this stage, the Earth had just come through the worst mass extinction in history, the Permo-Triassic mass extinction where up to 96% of all marine species and 70% of all terrestrial vertebrate species died out. The mass extinction created some new evolutionary opportunities, leading to the evolution of the very first mammals and, more importantly, DINOSAURS. So, where are we off to today with William Smith to look at Welsh dinosaurs…..? 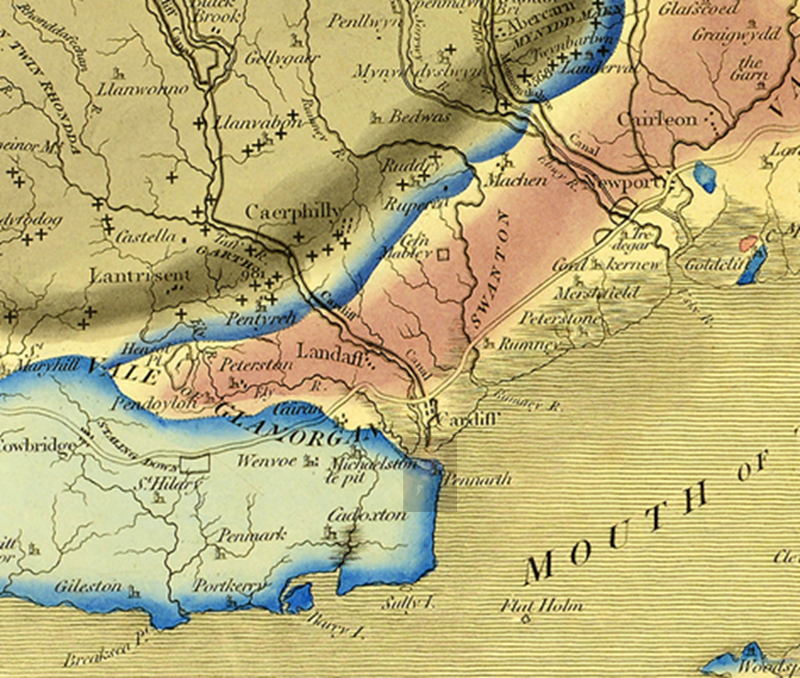 Close up of the South Wales section of William Smith’s map. Can you spot him hiding in the map? If you’ve managed to spot William Smith hiding in the map, you’ll see he’s near the coast at Lavernock Beach in Penarth. This is for a very special reason – it’s the site of a famous dinosaur skeleton find by local residents Nick and Rob Hanigan! The brothers went beachcombing for fossils after the storms of spring 2014 when, much to their surprise, they found the fossilised skull and bones of a dinosaur! The skeleton was identified as being distantly related to Tyrannosaurus rex, part of the theropod family, albeit a bit smaller. This dinosaur stood on two legs and was a small, agile animal around 2.2ft tall and 6.5ft long including a long tail for balance. Scientists recovered about 40% of the dinosaur’s skeleton, which was found embedded in sedimentary rocks at the base of a collapsed cliff. This specimen was subsequently named ‘Dracoraptor hanigani’; Draco meaning Dragon (the symbol of Wales) and hanigani honouring Nick and Rob Hanigan who discovered the amazing fossil. Nick and Rob subsequently donated the specimen to the National Museum of Wales where you can now see it on display. Dracoraptor hanigani seen as a shoreline dwelling predator and scavenger. Image from wikimedia commons. 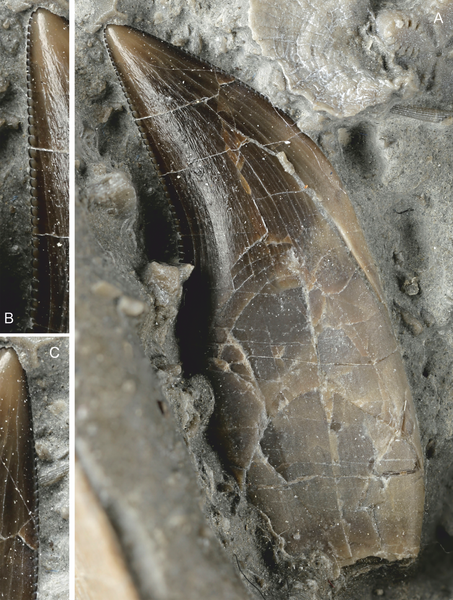 The fossil assemblage included very sharp teeth and claws (see the pic below). Theropods are described as being vicious predators. They started evolving very quickly in the early Jurassic, but are only known from a few specimens worldwide. This one is thought to be quite a young specimen as it’s small, but despite its age it still has super sharp, serrated teeth, ready for hunting. They are thought to have lived on a diet of insects, small mammals and other reptiles (or time travelling Georgian geologists, I’m sure!). They also think that this dinosaur had a fuzzy coating of simple proto-feathers, as seen on other theropods, that would have been used for insulation, and maybe even for display! This dinosaur is dated to the early Jurassic period, approximately 200 million years ago, and thought to be one of the oldest known Jurassic dinosaurs in the UK. Dracoraptor tooth. Image from Wikimedia Commons. This period was dominated by warm seas, hot deserts and lush forests. Wales was gradually flooded with rising sea levels in the Triassic and Early Jurassic, and much of this area was dominated by shallow seas and coastal environments. Rocks Jurassic in age are found across the Vale of Glamorgan and can be seen in coastal outcrops of layered Jurassic Limestone, often called the ‘Lias’. The Lias group is a sequence of alternating limestone and mudstone beds which could have been formed by a cyclic change in depositional environments around a shallow sea. 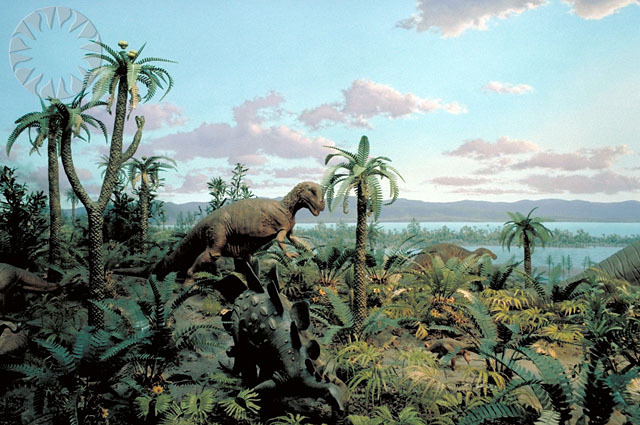 Had William Smith been around in the early Jurassic period, he would have been basking in a warm climate surrounded by warm shallow seas (something like what you see in the diorama below) at the early stages of dinosaur evolution and diversification. Sounds lovely, but he almost certainly would have ended up as victim to myriad predators. Alongside dinosaurs, fighting to be top of the food chain would have been the early ancestors of crocodiles and mammals. Biodiversity had been significantly impacted by first the Permo-Triassic mass extinction and then another mass extinction event at the end of the Triassic period. These two extinction events made room for the evolution of big mammals and dinosaurs through the vacating of ecological niches. The Jurassic eventually became host to some of the most diverse organisms that the Earth has ever seen, including the first birds and the reign of the dinosaurs. Diorama showing how some Jurassic life may have looked. Image from Wikimedia Commons. Map of the Jurassic Continents. Image from Wikimedia Commons. In terms of palaeogeography, the Jurassic was a time of continental break-up. The supercontinent Pangaea that had dominated the Devonian, Carboniferous, Permian and Triassic periods started to break apart in the Jurassic through the development of oceanic rifts and subduction zones. It was during this time that the current oldest surviving oceanic crust was formed. All of the crust older than this has since been put through the wringer of plate tectonics and lost through subduction. During the Jurassic Period, modern day Europe and North America as part of Laurasia were located in the northern hemisphere, with Gondwana comprising modern day South America, Africa, India, Antarctica and Australasia in the southern hemisphere. The two were separated by the Tethys Ocean. 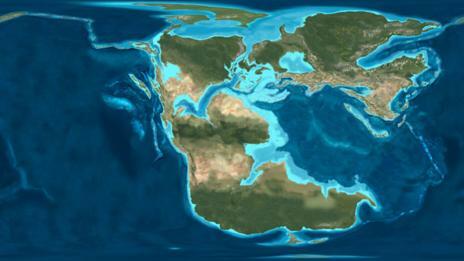 The ongoing splitting apart of Pangea led to the eventual development of the Atlantic Ocean and the Gulf of Mexico. For more information on the famous Dracoraptor hangani and the Jurassic period you can visit the following links. Tags: advent calendar, climate change, dinosaurs, Dracoraptor hanigani, environment, fossils, geography, geology, history, Jurassic, maps, mass extinction, palaeontology, Wales, William Smith. Bookmark the permalink.